Field robots and plane-based remote sensors can patrol the earth and the sky to monitor the gases that cause climate change. 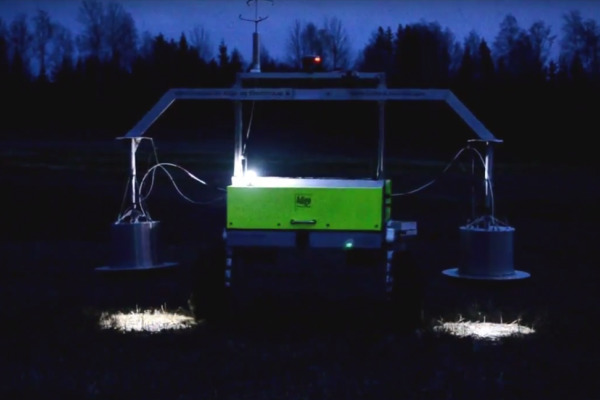 Standing on three large wheels that help it avoid getting stuck in the soil, the Field Flux robot is able to lower two sampling chambers held on large arms to test soils for tiny amounts of nitrous oxide (N2O). Though carbon dioxide (CO2) is better known when it comes to climate change, N2O has a global warming potential that's over 300 times higher. In other words, a single molecule of N2O is as damaging as 300 CO2 molecules. 'One of the great difficulties in quantifying N2O emissions from agriculture is that it changes with a factor of 100 from one day to the next and one spot to another,' said Professor Lars Bakken, from the Norwegian University of Life Sciences in Oslo. He is a microbial ecologist on the NORA project, which is working out ways to reduce N2O emissions from soils and developed the monitoring robot alongside Norwegian company Adigo. 'This is actually the whole reason we made the field robot. If you want to quantify emissions from a field experiment you have to measure over and over and over in many plots,' said Prof. Bakken. Using the robot, a field that took 27 hours to test manually can be done in just one hour. Those measurements are crucial in controlling N2O as they could allow farmers to treat their soils where needed. The N2O is produced by some soil microorganisms during periods when the soil is not well aerated, for example during heavy rain, or when the soil is tightly packed. Those organisms, mostly bacteria, then use nitrogen oxides instead of oxygen for respiration. Several of those bacteria can respire N2O by using a very special enzyme, the N2O reductase. The researchers in the NORA project discovered that this enzyme is prevented from functioning correctly in acidic soils, and also when there isn't enough copper present. Monitoring particles once they get into the atmosphere, where they are known as aerosols, isn't any easier. Researchers in the Marie Skłodowska-Curie Actions-funded ITaRS project, led out of the University of Cologne in Germany, are using remote aircraft-based sensors and ground-based measurements to get a handle on when clouds are likely to form or develop precipitation. 'One of the major uncertainties in atmospheric models is how clouds interact with aerosols in the atmosphere. We don't even know in detail how clouds are formed,' said Dr Maria Barrera Verdejo, an ITaRs fellow working with lidars and microwave radiometers. To form, clouds need particles such as dust or pollen for water to condense around. Improving the precision of ground- and air-based measurements provides researchers with new data they can use to better understand atmospheric phenomena, for example how and under which conditions storms will develop. 'My measurements can be used for something that is called data assimilation in weather forecasting. You feed in what the atmospheric state is, and the model calculates what is going to happen next,' Dr Barrera said.